Recommended Use: Mix two scoops in 10-12 fl oz water. Tastes like a real milk shake. BEFORE & DURING WORKOUTS: take Muscle Milk one hour prior to workout. For a truly awesome workout, take FAST TWITCH Power Workout Drink Mix before and during your workout. AFTER WORKOUTS: Take Muscle Milk within one hour of completing your workout. After workouts, the body is in a catabolic state. 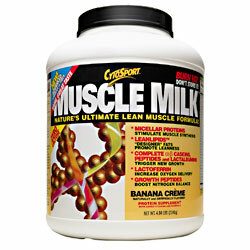 Muscle Milk helps reverse this muscle breakdown by providing the necessary nutrients for muscle synthesis. PRIOR TO BEDTIME: Sleep is actually a catabolic period. Remember, breakfast means to 'break your fast'. During any fast, you break down precious muscle tissue for energy. Muscle Milk will help you wake up more anabolic.